(TibetanReview.net, Oct06, 2015) – There has been yet another lone street protest against Chinese rule carried out by a Tibetan in Ngaba (Chinese: Aba) County of Sichuan Province in a continuing trend since mid-July this year. 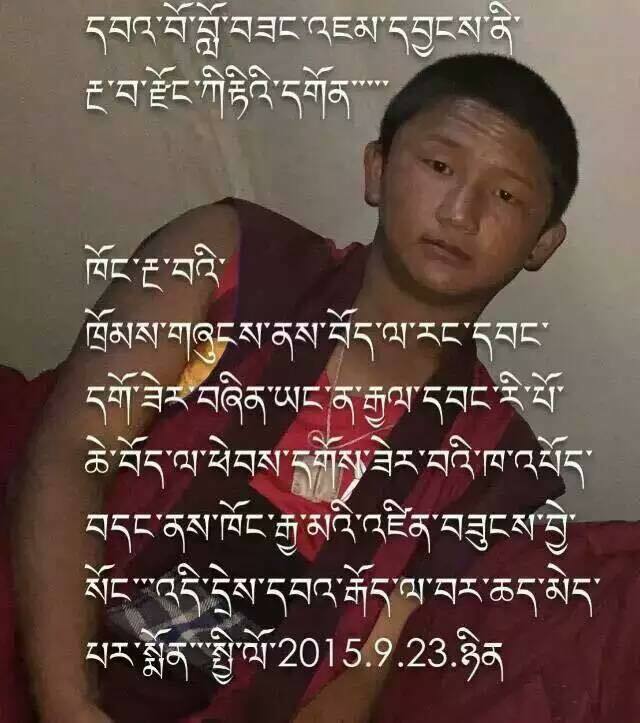 Lobsang Jamyang, a 15-year-old monk of Kirti Monastery, was held by Chinese police around 4 pm Beijing Time on Sep 13 within minutes of having started his protest march on the county-town road, said Dharamshala-based Tibetan Centre for Human Rights and Democracy Oct 5. “Lobsang Jamyang shouted slogans calling for freedom in Tibet and return of Dalai Lama as he walked from Pawo Sanglam [‘Martyrs’ Road’] to the main road of Ngaba county town,” the centre quoted “a source with close contacts in Ngaba” as saying. Originally from the nomadic Village No. 2 of Ngaba’s Meruma (Maierma) Town, he was reported to be an elementary Buddhism class student at the monastery at the time of the incident. His current whereabouts remain unknown, as is the case with all such detentions in Chinese ruled Tibet. The centre also said that two lay Tibetans, believed to be in their teens and named as Thinley and Lobsang, had also been detained around midday on Sep 10 in Ngaba County-Town. They too were reported to have staged a peaceful protest against Chinese rule, calling for “freedom in Tibet” and praying “long live His Holiness the Dalai Lama!” They were said to have held up a portrait each of the Dalai Lama as they staged their protest. Their whereabouts also remain unknown. Both were reported to belong to the Soruma Village in the county’s Choejema (Qiujima) Township.